The most epic adventure yet! 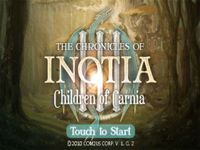 With the coming of age ritual ahead, Lucio and Ameli from Carnia village will acquire gauntlets, and somehow find themselves involved in an adventure they could have never imagined. Lucio and Ameli soon realize that they have extraordinary destinies laden before them. Will the Warriors, whose predestined fates that are meant to last for thousands of years be able to find happiness?